When passing a horse and rider, what should you do? When passing a horse and rider, what should you do? When passing a horse and rider, what should you do? Horses can be easily frightened. Slow down and be prepared to stop. Overtake gently, without revving the engine. Slow down when passing horses and give them a wide berth. Horse riders have the same rights as motorists on the road, and therefore should be obeying the rules of the road, but not all riders know that they have this obligation. Young riders that don't have a driving licence will be less aware of the dangers as they will not have learned how to manoeuvre in traffic and will have less conception about how long it can take a car or truck to stop. A rider will generally choose to ride on the verge, but if there is no verge and they are riding on the road you will need to give them even more room. A rider is not obligated to ride on the verge. A horse will hear your vehicle approaching from the rear, but won't necessarily be able to see it, particularly if they have blinkers on. However, many modern cars (e.g. hybrids) are now very quiet and if there is a large amount of ambient noise such as high winds or farm machinery, the horse might not hear your vehicle until the last minute, which could startle it. A startled horse might lurch sideways into your path before the rider can regain control. A horse can easily weigh 500kg and the weight is carried high up, so if you hit a horse, the body of it will hit your windscreen causing a lot of damage. Motorcyclists are even more at risk. A horse rider might signal you to slow down by holding their arm out and moving their hand up and down. If they need you to stop they may show a raised hand. This might be because they are training an inexperienced horse in using the road. At a roundabout a horse rider will stay left the whole way around, even though they might be turning right. 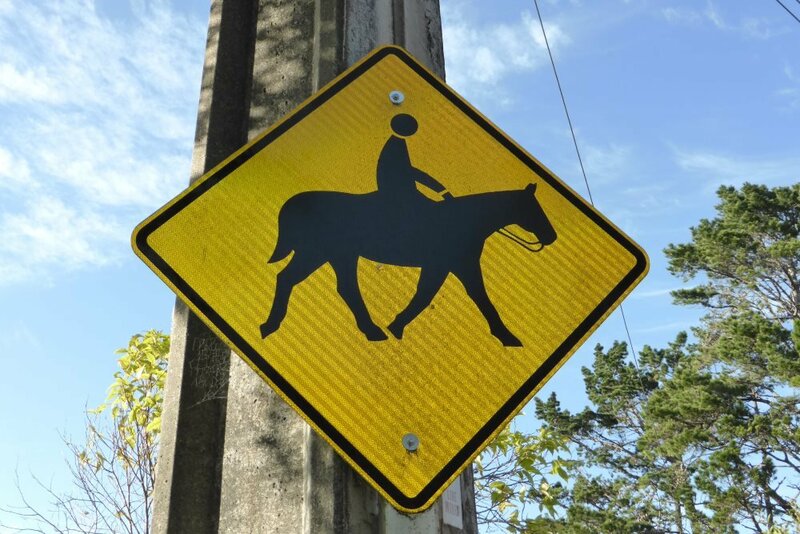 Watch for hand signals and give the horse and rider priority. There are no speed guidelines for overtaking a horse in New Zealand. The British Horse Society recommends 25kph, but if you have your stereo blaring then this could still frighten the horse, as can noisy blow-off valves or exhausts as you accelerate away. Once you are past the horse, accelerate gently away. Don't use your horn. 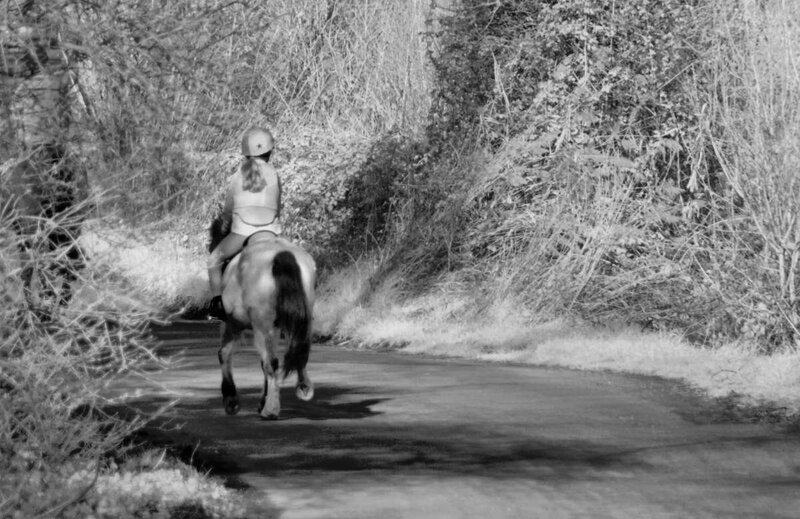 A horse rider can take up a decent portion of a narrow country road, as you can see in the photo below. If you were to come around this corner at speed, would you be able to stop? The Road Code says that on an unlaned road you must be able to stop in half the clear distance of road you can see in front of you. 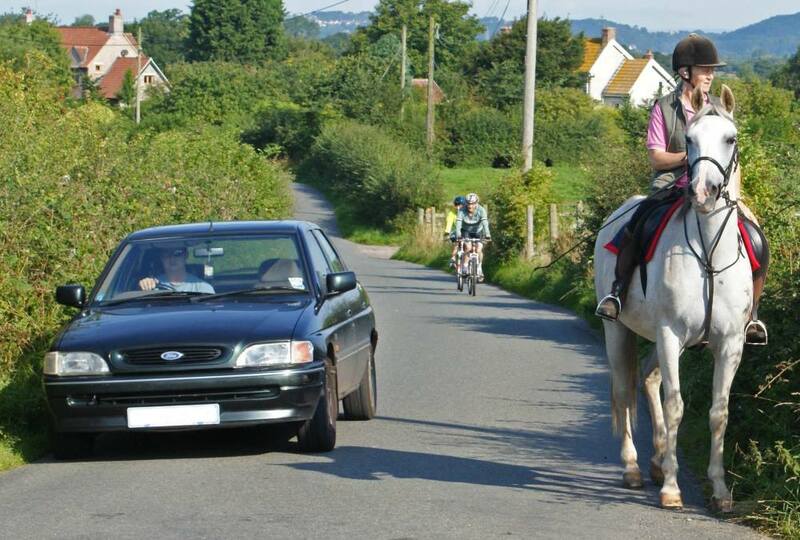 The photo below shows the ideal situation for overtaking a horse. The horse rider is riding as far left as is practical and, in this case, has actually stopped to wait for the car to overtake. The driver has moved as far right as possible on the road. If other traffic is coming, a driver should wait until they can overtake safely. If you are overtaking a horse and buggy then you will need to make sure you can overtake safely without crossing any yellow lines such as in the image below. You are allowed to overtake where there is a yellow line, but only if you can do so without crossing the line.